“As an online instructor you may not be serving in the role of course designer. You may be teaching courses that were completely designed by someone else, but you may be able to provide feedback for course revision. You may also have the opportunity to serve as a subject matter expert (SME) on a design team charged with developing a new online course. The creation of “useful, usable, and engaging content” is critical to the success of your students. 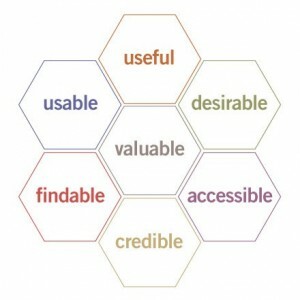 As you review my [Melissa Venable ] take on Morville’s User Experience Honeycomb, as it relates to online learners and course design, consider how the facets have an potential impact on your courses. Useful: What do your students do with the activities, materials, links, and other content you include in your course? Does each of these items add to the understanding of a complex concept in some way? Or perhaps they directly support the achievement of an established learning objective in the course? Consider the usefulness of each item from the student’s perspective. Usable: Does the content work correctly within your course site? Students, like the rest of us, can be deterred when links are broken and interactions don’t work as intended. Are your course materials easy to use? Look for places where the addition of detailed instructions can help students get started. Findable: This component deals with navigation and layout. How easy is it to find the different materials included in your course? Review the menus and links in your online course when adding a new item and consider where should it be added on-screen and in relation to other existing content, so that students will not only be able to locate it, but will use it. Credible: Rarely is an online course, with all of its related materials, the creation of a single author. Whether the course is created by a team or by a single instructor who includes links to outside materials, it’s important for the students to know that the content is credible in terms of its source, purpose, currency, and relevance. Provide background information about why you’ve chosen the materials you have for the course. This could also be a great way to introduce your students to leaders in your field and relevant resources and publications. Desirable: Morville’s description of this facet includes “an appreciation for the power and value of image, identity, brand, and other elements of emotional design.” We’ve all landed on web pages that didn’t grab our attention, causing us to move quickly to something else. How well does your course capture the interest of your students? Accessible: Accessibility issues are a major consideration of web designers, including those who work on education and training projects. How will students with disabilities access your course materials? Depending on the type of media and content you are providing, there are multiple ways to assist learners including captions for video presentations, provisions for screen reading software, and printable text-based transcripts for audio recordings. Take a look at The University of Central Florida’s Teaching Online site for more accessibility resources.